Title: there's only like three doors on the first floor, and everyone on the third floor just gives you the runaround and sends you somewhere else. on the forth floor everything's your fault, and everyone on the fifth floor is a screwup. comedy! Alt-text: ROOM 406 IS A MESS. 204 IS EMPTY. THERE ARE SEVERAL DOORS LABELED "300". WHY ARE YOU NOT LAUGHING. 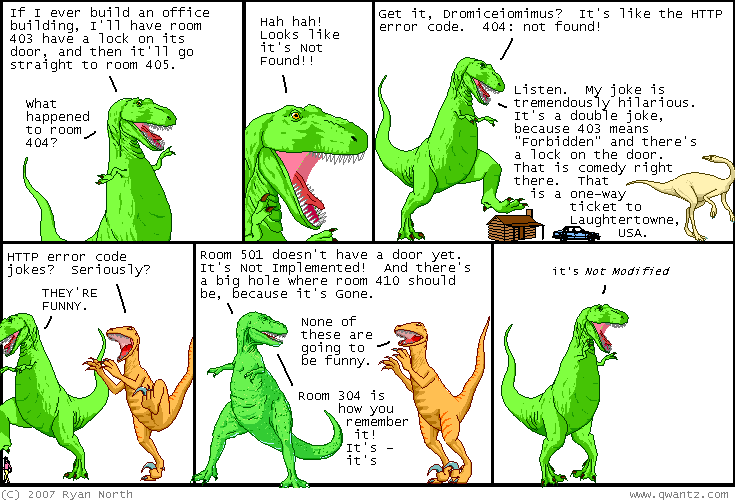 Dinosaur Comics is great, second only to xkcd. I can't believe I got that!